Topic of promiscuous portgroup on virtual switch came up lately from different directions therefore I decided to summarize some information and also debunk one particular myth. So does this mean enabling promiscuous port on a vSwitch will make all vSwitch frames visible to VM connected to such port? 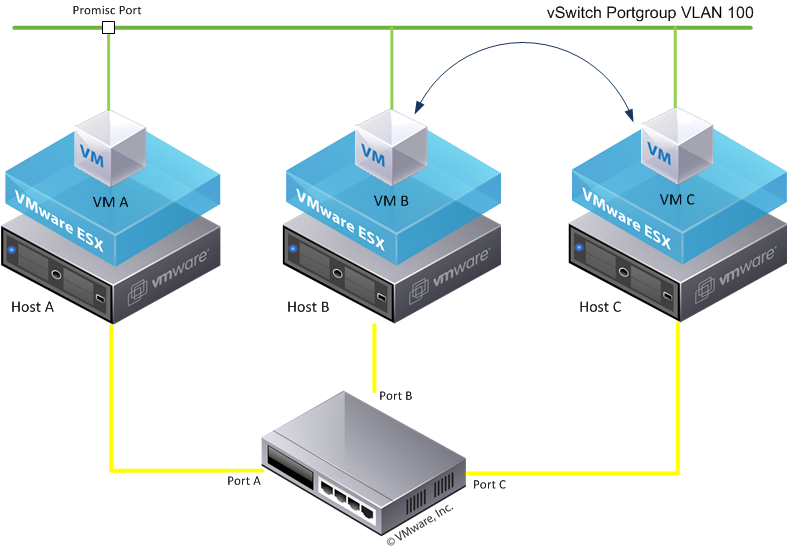 So let’s step back and explain how VMware vSwitch works. The main difference from a physical switch is that it does not learn MAC addresses by observing passing traffic (and that is why you hear sometimes networking people saying it is not a real switch). It instead relies on the the information the hypervisor (VMkernel) provides about VM vNIC MAC addresses. It basically knows that all vSwitch non uplink ports are used only by VMs (with known MAC addresses). So a frame originating on a VM connected to vSwitch will be either delivered to the right port on the same host (if it is in the same VLAN and matches the destination MAC) or sent to uplink (usually trunk) port. There it is either flooded or switched to the right port by the physical switching infrastructure depending if it is unknown or known unicast and eventually delivered to the right host (if it belongs to a VM) or to a physical device. So if you think about this behavior described above it should be clear that VM connected to a promiscuous port or portgroup will not see all the vSwitch traffic but only the traffic that is accessible on the host where the VM resides. 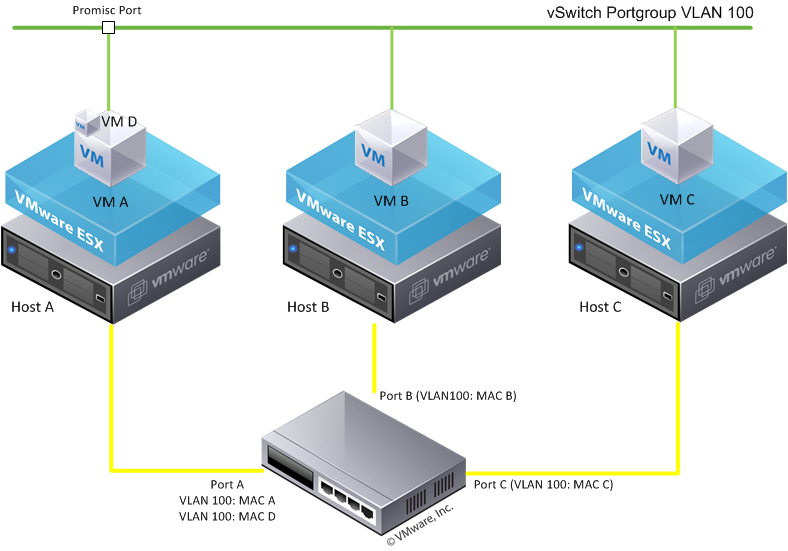 All VMs are in the same portgroup of VMware vSphere Distributed Switch in VLAN 100, while the port of VM A is set as promiscuous. So which traffic between VM B and C will and will not VM A see? When VM B (with MAC B) will try to talk to VM C it will send broadcast ARP packet to find VM C MAC address (MAC C). The physical switch will see the broadcast frame coming to Port B, will note the MAC B address on VLAN 100 is behind this port and will flood the frame to all other ports. vSwitch on host A will get this frame and forward it to all ports on VLAN 100 (it is a broadcast frame) thus to VM A.
VM B will get the ARP request and reply to it with unicast reply from MAC C to MAC B. Physical switch will enter the MAC C into its MAC table noting it is behind port C on VLAN 100 and switch the frame to already learned location of MAC B – to port B. vSwitch will then deliver the frame to VM B. 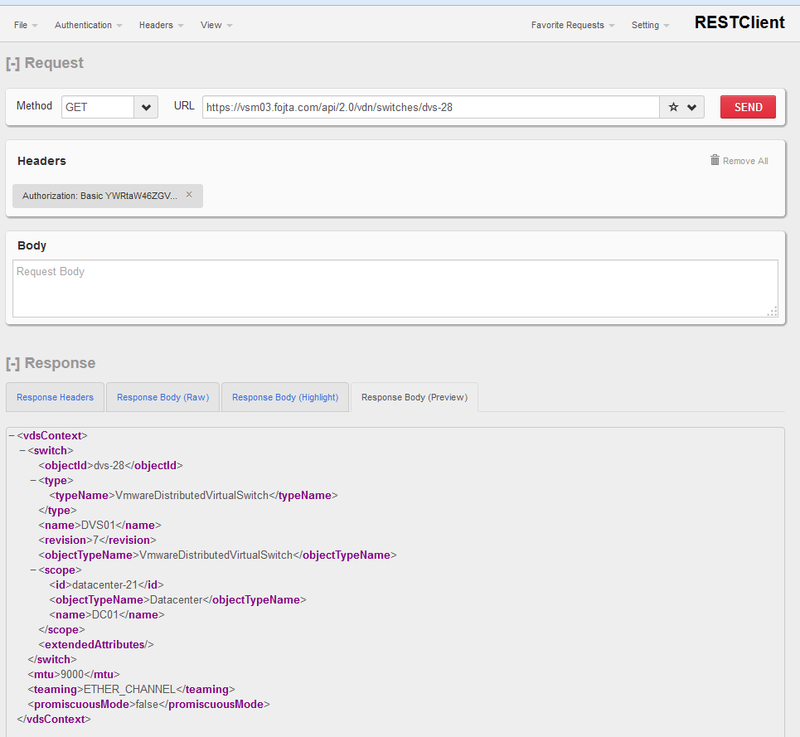 As you can see no frame was delivered to host A and therefore VM A will not see the reply. Now when communication between VM B and VM C has been established they can start talking with each other and physical switch knowing locations of MAC B and MAC C will switch the frames only between ports B and C of hosts B and C. VM A will see nothing from this unicast communication. After while the MAC table on the physical switch will expire (if it has shorter timeout than VM B or C ARP cache). In such case it will forget the location of MAC B or C and will flood frame to B (or C) to all VLAN 100 ports and only then VM A will get the frame as the flooded frame reached host A as well. Broadcast and possibly multicast traffic from VM B or C will reach host A and thus VM A as well. This should debunk the myth that promiscuous port can be used for packet sniffing. For that you need port mirroring. There are however use cases for promiscuous port and these are related to the (non-)learning behavior of vSwitch. If VM A would like to see traffic for additional MAC address D which is not hardcoded to its vNIC promiscuous port is requirement. Examples of such use case are nested VMs (VM A is virtual ESXi host) or floating MAC for highly available load balancing VMs (MAC masquarade). As the MAC D responds to ARP requests the physical switch will learn that MAC D is behind port A and will deliver the frame properly. vSwitch on host A will then flood the traffic to all promiscuous ports in the VLAN on the host as it does not know otherwise where to deliver it. Read William Lam’s article how to improve efficiency of this through VMware Fling (VMkernel vib plugin) that gives vSwitch learning ability. I was looking for lightweight tool which would help me with troubleshooting multicast on VXLAN transport network (underlay). While both vCNS and NSX have built in tools (pings of various sizes and broadcast packets) I needed something more flexibile where I could do arbitrary IGMP joins and leaves. PING 239.1.0.10 (239.1.0.10) 56(84) bytes of data. Hosts 1.1.0.1 and 1.1.0.3 replied to ping on 239.1.0.10 multicast group. One of my customers has configured VXLAN in vCloud Director environment and then created multiple Provider and Org VDCs and deployed virtual networks. Then we found out that MTU and teaming policy configuration was set up incorrectly. Redeployment of the whole environment would take too much time, fortunately there is a way to do this without rip and replace approach. First little bit of background. VXLAN VTEPs are configured in vShield Manager or in NSX Manager (via vSphere Web Client plugin) on cluster/distributed switch level. vShield/NSX Manager creates one distributed switch port group with given parameters (VLAN, teaming policy) and then for each host added to the cluster creates VTEP vmknic (with configured MTU size and DHCP/IP Pool addressing scheme). This means that teaming policy can be easily changed directly at vSphere level by direct edit of the distributed switch port group and MTU size can be changed on each host VTEP vmknic. However every new host deployed into the VXLAN prepared cluster would still use the wrong MTU size set in vShield/NSX Manager. Note that as there can be only one VTEP port group per distributed switch, clusters sharing the same vSwitch need to have identical VTEP teaming policy and VLAN ID. with the Body containing the new configuration. Make sure vCNS/NSX Manager certificate is trusted by Firefox. In Firefox toolbar click on RESTClient icon. 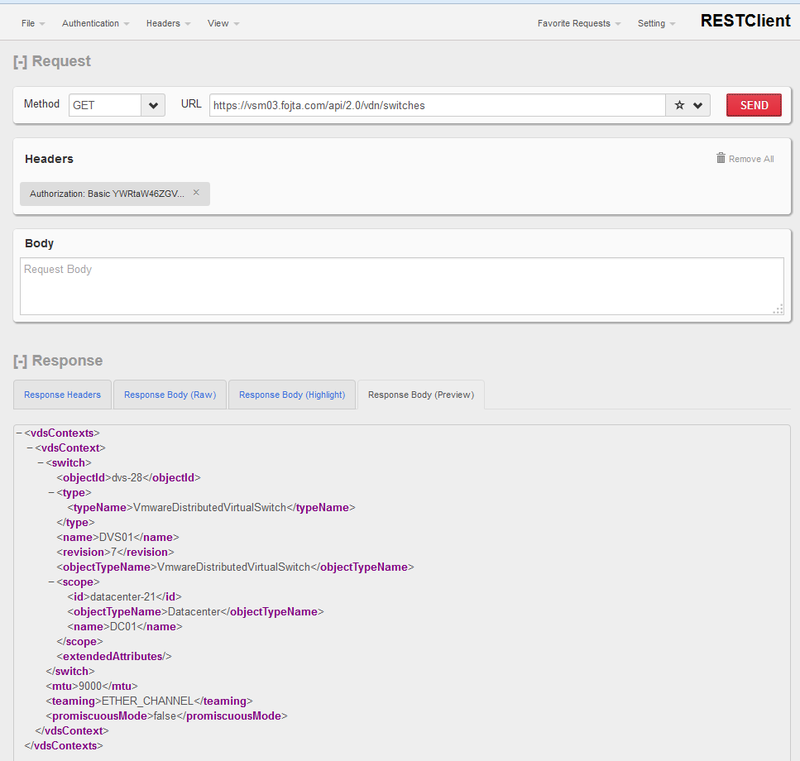 Change the metod to PUT and add a new header: Content-Type: application/xml. Send the request. If everything went successfully we should get Status Code: 200 OK response. Now we need in vSphere Client change MTU size of all existing hosts to the new value and also change the teaming policy on VTEP portgroup (in my case from Route based on IP hash to Use explicit failover order). Existing VXLAN VNI portgroups (virtual wires) will use original teaming policy, therefore they need to be changed to match the new one as well. When using FAILOVER_ORDER teaming policy there must be also specification of the uplinks in the XML. The uplinks should use the names as defined at the distributed switch level. (without the switch-id at the end). There is a new feature in vCloud Director 5.1 which was requested a lot by service providers – configurable limits on routed external networks (for example Internet) for each tenant. 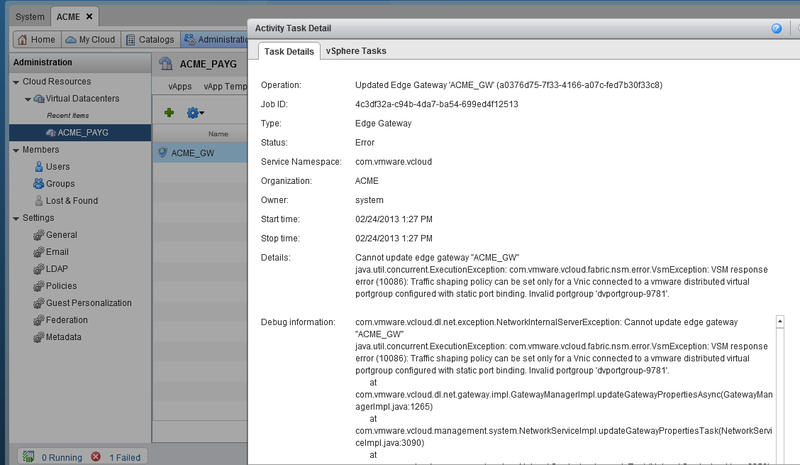 Limits can be set both for incoming and outgoing directions by vCloud Administrator on tenant’s Edge Gateway. However this feature only works with VMware vSphere distributed switch – it does not work with Cisco Nexus 1000V or VMware standard switch. Why? 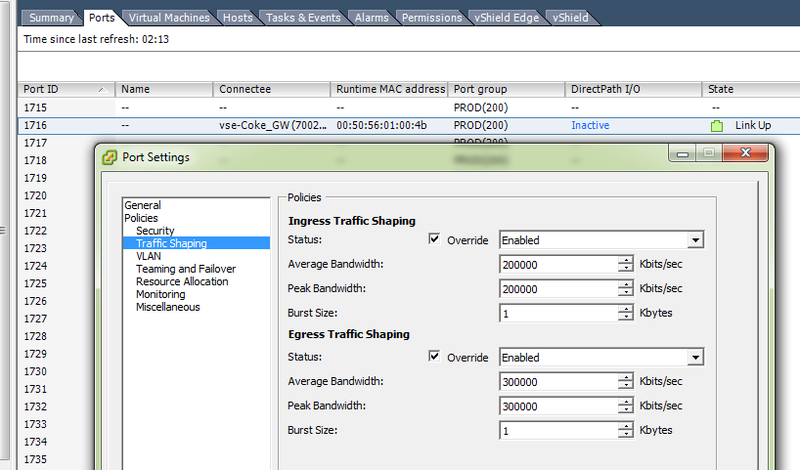 Although the feature is provided by the Edge Gateway, what is actually happening in the background is that vShield Manager instructs vCenter to create a traffic shaping policy on the distributed vswitch port used by the Edge VM. Standard switch does not allow port specific traffic shaping and Nexus 1000V management plane (Virtual Supervisor Module) is not accessible by the vShield Manager/vCenter. The rate limit could be applied on the port of the Cisco switch manually, however any Edge redeploy operation, which is accessible by the tenant via GUI would deploy a new Edge and use different port on the virtual switch and tenant could thus easily disable the limit. 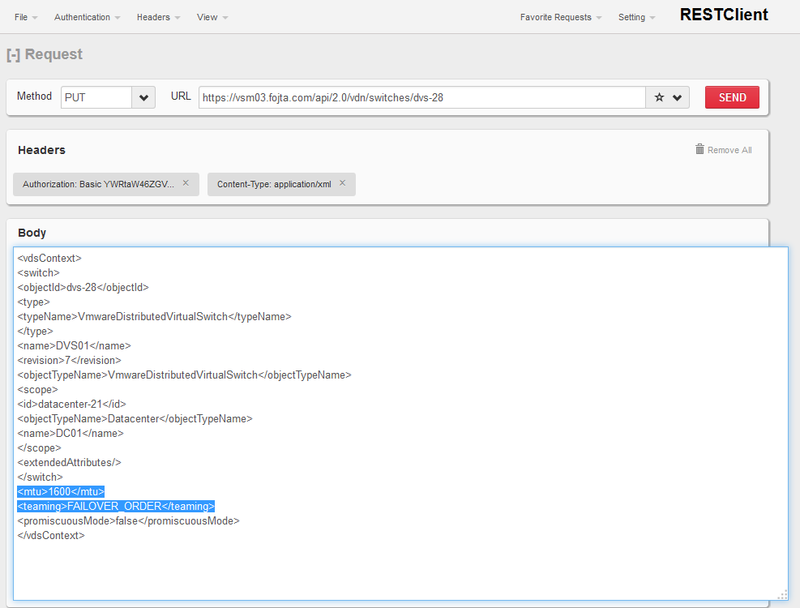 java.util.concurrent.ExecutionException: com.vmware.vcloud.fabric.nsm.error.VsmException: VSM response error (10086): Traffic shaping policy can be set only for a Vnic connected to a vmware distributed virtual portgroup configured with static port binding. Invalid portgroup ‘dvportgroup-9781’. Btw the rate limit can be set on the Edge (when not using vCloud Director) also via vShield Manager or its API – it is called Traffic Shaping Policy and configurable in the vSM > Edge > Configure > Interfaces > Actions menu. Do not forget to consider this when designing vCloud Director environments and choosing the virtual switch technology.